Mrs. Walker fell asleep in Jesus on Monday, Jan. 6th, 1902, and on the 29th of the following June her husband also entered into rest. At the time of their decease they were each eighty years of age. Mrs. Walker, whose maiden name was Elizabeth Butten, was a native of St. Blazey, Cornwall, from whence, at the age of 17, she removed to Jersey. Mr. Walker, who hailed from Colingbourn, Wiltshire, came to live in Jersey about the same time. They were married over fifty-eight years ago and have been members of our St. Heliers society for about fifty seven years. They were both converted under the ministry of the late Rev. Mr. Knox. In the home, in the business and in the church Mrs. Walker was a true helpmeet to her husband. There was a complete identity in the purposes and interests of their lives. In her earlier years she was a woman of great vigour and this with her strong individuality enabled her, with a cheerful confidence, to hold up under difficulties, or push ahead through them, that would have dismayed feebler souls. Year in, year out, for fifty years she, with her husband, and a few other loyal souls, bore up under the severe financial strain involved in keeping Primitive Methodism alive in Jersey. As a church, our debt to such faithful, humble members is simply incalculable. Ministers come, to soon leave again, but with the loyal few of the church their ever remains the serious burdens of the church. Yet these burdens never frightened her nor those who worked with her, (some of whom remain with us in honour to this day) but, through good and evil report, she held on steadily, patiently and hopefully to her allotted task. Next to her own home the church held the first place in her affections, and I am certain of this that not seldom in her home many quiet sacrifices were made for the house of God. She met with God’s people so long as she was capable of walking a few steps at a time. There was no lingering sickness. She was simply worn out and died as easily as a tired child going to sleep. It was touching to see how at the last she went back again to her early married life and asked for the children. She has met some of them now in the fair land where death never deals his cruel blows. On July 2nd he was carried into his dearly loved chapel for the last time, and then laid to rest amid every token of affectionate respect from the officials of the church. At the close of the service a gentleman, quite unknown to the writer, stepped to the edge of the grave and quietly said, “There lies a man who for many years did all the work required on my property, and a more trustworthy, a more upright man I have never met with.” So may we, 0 Lord, walk before Thee with the humility of holiness all the days of our life. His work was done, splendidly done, and all is well. He and his good wife travelled a long and honourable road together and in death they were not long divided. This is as it should be. His memory is a precious heritage to his church, – a memory of transparent goodness, consuming love to Christ, and steady, fervent devotion to Jersey Primitive Methodism. 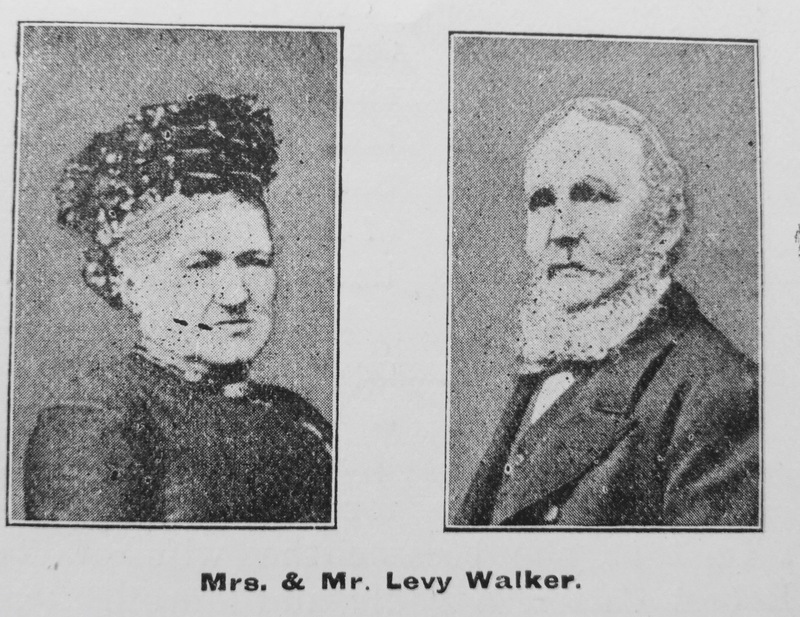 Levy Walker was born abt 1822 at Colingbourn, Wiltshire. His father was James Walker. Census returns identify the following occupations for Levy (sometimes recorded Levi). Levy married Elizabeth Button on 31 December 1843 at St Helier, Jersey. Elizabeth was baptised on 16 February 1823 at St. Blazey, Cornwall. Her parents were Henry and Mary. Census returns identify six children.